It is the last day of 2018. As I look back over the year, I am also somewhat looking forward to the next... making some plans and some decisions. 2017 ended on a very happy note for me. We had a sudden opportunity to spend a few days before Christmas on a whirlwind trip to Manhattan in NYC... the flights were very long and there were some delays but it was so worthwhile. We had only 3 days and nights to pack in as much siteseeing as we possibly could. 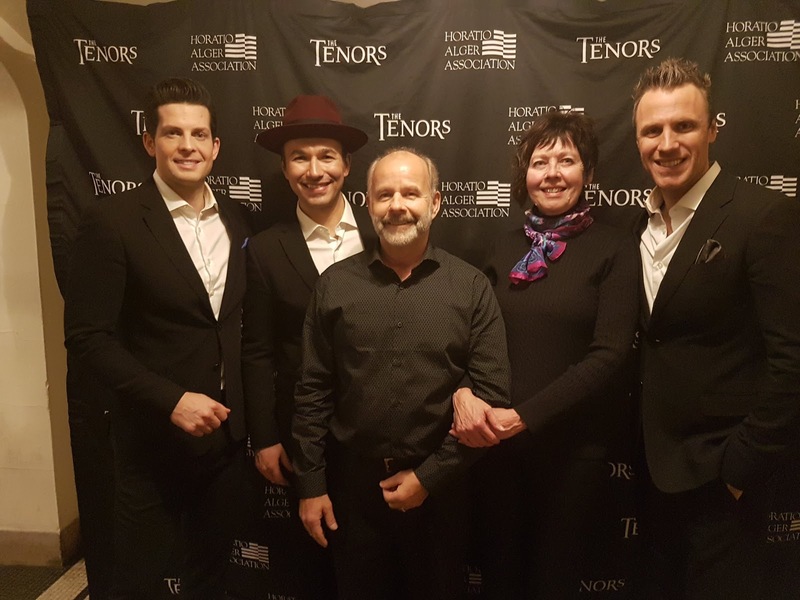 We also took in a Canadian Tenors Christmas concert and had the opportunity for a meet-and-greet afterwards. They were very gracious, especially after learning how far we had come to see the concert. A few days after we arrived home the Captain was hit with a really horrible cold virus and of course shortly after, I was too. It was quite awful. We spent most of January 2018 in bed, trying to recover. It knocked us both for a real loop. I had no energy to work out, and no interest in blogging. I had nothing to share in the fitness or healthy living arenas. As the year wore on, I was not inspired to get back to blogging at all. I let it go almost completely. I participated less and less in the social media groups I had joined. I did keep track of some, but with waning interest. A few times I was tempted to write a post, or share a recipe, but just did not. So here I am... on the last day of 2018, looking back at my year, and trying to make some decisions about going forward. Blogging holds more interest for me right now. I miss the camaraderie of some of my groups. I feel like I am planning things that I would like to share. We found some terrific new local restaurants this year. You will not be surprised that most of them are on the waterfront! And we also discovered a little pub in our neighborhood that is funky and very comfy. I did not run very much in 2018. I have missed it. I did walk though... a lot... Walking is definitely easier than running when you don't feel very well and doesn't take the effort of putting on special clothing... or even require a shower afterward if I am being totally honest. Walking is also easier when it is raining. I hate running in the rain, but walking does seem right. I did not follow any specific workout plan in 2018. My efforts were almost nonexistant the first quarter of the year actually. My upper body strength almost disappeared. My stamina and endurance suffered greatly. However, part way through the year I won a giveaway and was the happy recipient of a terrific package of gear from Lebert Fitness... a lovely set of pink Equalizer Bars, a Buddy System, and a Stretch Strap. For the past several weeks, the Captain and I have been working out 2 or 3 times a week with the Equalizer Bars and some dumbbells, in an effort to regain some strength and endurance, and to just get back to the routine of regular workouts. This is something we can do in our own living room and therefore very appealing. You will hear more about this in upcoming posts, I am sure. I have been doing a variety of yoga sessions over the past several months as well. I find yoga to be a good upper body workout and such a relaxing way to stretch. I love to stretch. It used to feel like such a waste of time. Now I revel in it! We played a lot of tennis over the Summer and even got in some golfing. I do love to be outside when the weather is nice and we had a particularly warm and dry Summer here. Lovely. And, on the food front, I am finally in a groove. I have developed a way of eating that is healthy for me. I can not handle much alcohol. I cannot handle much sugar. So, I am following a pretty low carb plan, and happy and comfortable with it. I am not stressing about my weight even though it is actually a couple of pounds over my ideal number on the scale. I feel pretty good with all of this and more relaxed. So, in 2018, we travelled a bit on the Island, and ferried over to Vancouver and into WA state to a favorite shopping area. We visited/reconnected with some family and frends. We are looking forward to more of that this next year, and actually have a major trip/adventure planned for late Spring. Will share more about that soon. and thankful for our health and happy life together. I think blogging and participating in social media is such a personal thing. I find it difficult at times, especially because I’m not a blogger that does reviews on anything and I’m hardly an ambassador for any products. So it’s just me and my little corner of the net. If you feel you want to share, that’s the best time and usually the most authentic! So, here’s to health and sharing and wonderful experiences in the new year! Yes walking is easier than running. Hope you can get back to it if you miss it. Hooray for another tennis player in the group. Wishing you a healthy and active 2019. Nice to see you back at blogging. Hope to connect with you more this year. I have also learned to revel in yoga. I hope you are able to love your blogging and make some awesome connections in 2019! I wax and wane constantly and have also been up and down (mostly down) on my blogging and fitness goals this year. Overall it was a good year; nothing stellar on either front. I too am hoping to get my mojo back. Here's to a better year for both of us! It sounds like you had a good year. I have no big plan on the horizon for 2019 and am feeling ... unmoored without something to look forward to! I've turned to walking and lots of yoga myself. I hope you and your family have a happy new year! I am all about walking! I think it's a shame how a lot of runners shun the simple act of walking, because it's such a great (non-impact) calorie burn. I make it a point to get outside, everyday, for a walk (or several), even on my "running" days. Welcome back! Sometimes, you just need to step back from everything, take a breath and get your thoughts together. I love that you are finding yourself back in your groove. Your 2019 is going to be amazing. Walking rocks. It uses a whole different set of muscles and requires a different type of movement. It's great for cross training and for overall fitness. Enjoy it! How fun your trip to NYC must have been! I did not run much this year either . . . well, it was way less. Sometimes you just need to step back. Cheers to 2019!